To get an instant quote on your removal send a message via chat, mobile or email with a photo of the tattoo and dimensions. Ann will get back to you asap with a fixed quote you can count on. We offer a free consultation so we can discuss the process of our treatments and costs involved. Come in, have a cup of tea, coffee or ice cold water and discuss getting your tattoo removed or just lightened. The cost varies on the size of the tattoo you wish to remove/lighten. The minimum cost is $50 per session. Call now to arrange your free no-obligation consultation so we can give you an accurate price. How does the laser tattoo removal work? The laser has different wavelengths of light which passes through the layers of skin to the ink. The laser breaks up the ink into small particles which the body removes via the lymphatic system. This takes a number of sessions with sessions being 4-8 wks apart. This gives your body time to do its job and get rid of any small particles. 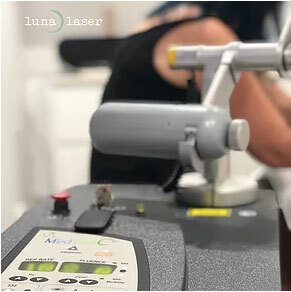 The number of sessions will depend on many things such as; size of the tattoo, location of the tattoo, the depth of the ink, colours used, if you want it removed or just lightened and how well your lymphatic system works to get rid of the small particles. When you come in for a free no obligation consultation, we will be able to give you an idea of the number of sessions you may require. The pain is like a burning sensation and a rubber band pinging on your skin together. The treatment can be painful depending on your pain threshold, but there are things we can do that will help with your discomfort. Another machine used during the laser tattoo removal is a Zimmer which blows out air at minus 30° C air. The cool air is applied to the tattoo before any laser treatments is undertaken so you won’t feel as much pain. You can also get numbing creams from the chemist prior to the appointment. Most of these creams need to be applied a few hours before the appointment. You could possibly get swelling, blistering, bruising, scabbing and a burning feeling. An information sheet about looking after your tattoo removal will be given to you after your treatment. Follow this information, like you would if you had just got a tattoo put on and you will be fine. If you do have any concerns feel free to contact us at anytime.